Provide a current and complete address that would allow shipment by a suitable carrier such as Federal Express (FedEx) (i.e. street address, building name or number, room number, city and state) - This address should coincide with the address on the DEA order form. For radio-labeled drugs or chemical substances, indicate the address to which such materials will be shipped. In case the shipping address is different from the researcher's address, a current copy of the radioactive materials license must be submitted. 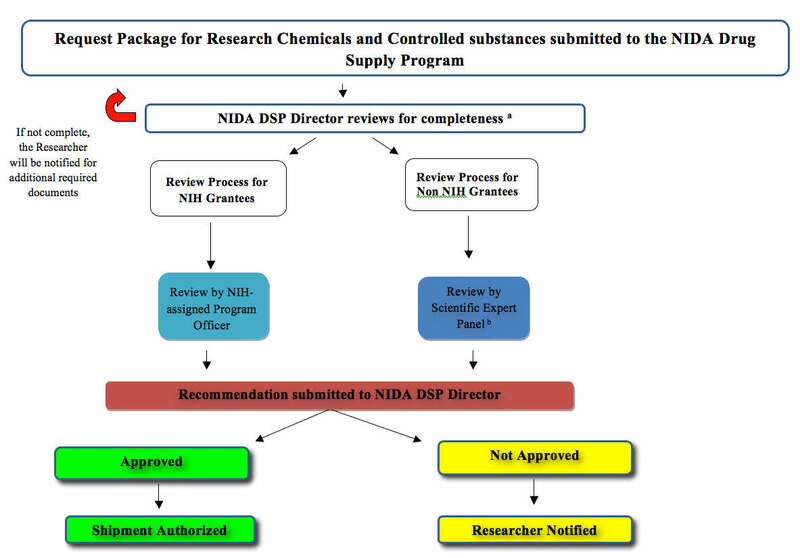 If applicable, NIH grant number of project and name and contact information of project’s NIDA/NIH Program Officer. If a non-grantee, no information on Program Officer and grant number is required. If multiple studies/tasks are planned, combine projected needs into a single order rather than placing several separate requests in a short time interval. The request should generally be limited to four items or drugs/compounds per order to avoid delay. Avoid drug abbreviations, and include specifications such as (+), (‑), (dl), base, or salt, as appropriate. Please visit the NIDA Drug Supply Catalog (PDF, 4.9MB) (this document is not fully accessible, for help viewing this content, please contact Rik Kline at 301-827-5243), for drug supply information. Calculate required amount of drugs or chemical substances for your project and submit your request well in advance of your planned experiments or tasks, or 6‑8 weeks prior to depletion of stock on hand for ongoing studies/tasks. Justification of quantities of drug(s) requested. If the request is related to a previously submitted protocol, provide a reference to this protocol and a brief statement of progress along with references to resulting publications. 5. A completed DEA Order Form-222 for Schedule I-II controlled substances. DEA Form-222 is not necessary for drugs in Schedules III‑V, but a valid registration for the appropriate schedule is required. Under the third column of DEA Form-222 (Size of Package), list quantities as bulk weight. Radio-labeled compounds must be listed by weight and NOT by units of activity. 6. A copy of current DEA registration, Form DEA-223 for controlled substances. It is the Research Investigator's responsibility to keep his/her registration current and to verify the drug code for requested drug. Investigators who request a Schedule I drug and/or Etorphine HCl or Diprenorphine must provide DEA documentation under which the requested drug is covered under their current DEA registration. Avoid drug abbreviations, and include specifications such as (+), (‑), (dl), base, or salt, as appropriate. 7. For radioactive compounds, a copy of Nuclear Regulatory Commission license. For more information, please visit the Nuclear Regulatory Commission licensing website. International requests for controlled compounds should provide their United Parcel Service (UPS) Supply Chain Solutions account number to bill shipping charges. For non-controlled compounds the investigator should provide their FedEx account number. Foreign investigators requesting drugs or other substances that are not very stable should be certain to make advance arrangements that would allow these drugs or other substances to be released to them expeditiously. This is particularly relevant when dealing with radioactive materials with high specific activity (>1.0 Ci/mmol). These compounds are shipped as solutions in ice and will not stay cold for more than 48 hours; they must be retrieved and put in cold storage immediately to prevent decomposition. Foreign investigators should also be aware that compounds are shipped with a listed value for insurance purposes. Since this may cause problems with customs officials, investigators should determine in advance what steps should be taken to avoid these complications. Often an official statement that the compounds are for research only and have no commercial value is sufficient. NOTE 1: ETORPHINE AND DIPRENORPHINE - Request for either of these two compounds should be made on separate order forms when ordering additional compounds at the same time. Etorphine hydrochloride and diprenorphine (free base or hydrochloride) are Schedule II drugs, however etorphine free base is a Schedule I drug. Therefore, etorphine free base should be ordered using DEA Form-222 as is appropriate for all Schedule I drugs. NOTE 2: CARFENTANIL, ETORPHINE AND DIPRENORPHINE – The DEA registration of a research investigator requesting these compounds must show the proper registration for such compounds. InvestigationalNewDrugINDApplication/default.htm. For more information on the Nuclear Regulatory Commission License, please see: http://www.nrc.gov/about-nrc/regulatory/licensing.html. Foreign applicants are required to submit additional documentation, including an import permit from the country to which the drug(s) are being shipped. b Members of the Scientific Expert Committee includes subject matter experts, identified by the NIDA Drug Supply Program.